Surfboardriders on the Stage, Sydney. Wellington, Volume XVII, Issue 918, 15 February 1918, page 12. LYALL BAY MERMAIDS AMD MERMEN. RANDOM SNAPSHOTS ON THE BEACH OF SEA-BATHERS AND SUN-BATHERS. Some further pictures is! the successful- carnival at Manly. (1) Freshwater surfer riding a -board head downwards. (2) Start ?of .the gold. rush. (3) Standing on l suirf board. Saturday 2 March 1918 page 2 (Advertising). LAST DAY AND NIGHT OF THE BOOM. The following is the programme for to-day. It's going to absolutely bust the record. BIGGEST GOLD RUSH EVER SEEN. If you do not wish to join in, come down and see the diggers at work, prospecting for the Hidden Reefs. They are there - only want finding. Sensational Surf Exhibitions and Wonderful "Duke" Surf Board Shooting, given and demonstrated by the Expert Members of the Manly, North Steyne and Freshwater Life Saving Clubs. shown from the Headlands, overlooking the Ocean Beach and Pacific Ocean. Special preparations have been made to make this display a Record Success. Steamers sail for the Carnival every few minutes all day and evening from No. 3 Jetty, Circular Quay. Fares: ADULTS 4d, CHILDREN 2d. Sydney, 8 March 1918, page 16. Some further pictures of the successful carnival at Manly. (1) Freshwater surfer riding a board head downwards. (2) Start of the gold rush. (3) Standing on the surf board. Victoria, Saturday 23 March 1918, p. 2. [At St. Kilda] A surf board display was given by Mr. H. L. O'Hara, chief Victorian instructor of surf reel work. Monday 25 March 1918, page 5. The boards proved a distinct success. Sydney, Friday 25 March 1918, page 3. Large surf boards wore used to some purpose at Bondi yesterday for the life-savers, who not only rescued half a dozen surfers on them, but brought them into action to assist scores of others who were likely to get into difficulties. The surf was not at all dangerous, but there was a deep channel running parallel with the beach, and that had to be negotiated by those anxious of getting "shoots from the bank on the other side. Although the channel was only about 20 yards across, there was a nasty "pull" towards the shore, and bathers found that the swim to the bank was not the easy task it looked. In fact, it was a tough journey, and while surfers who did not become excited, got across all right, others, who got flurried on discovering that they were not making as much progress as they thought they should, had many anxious moments. 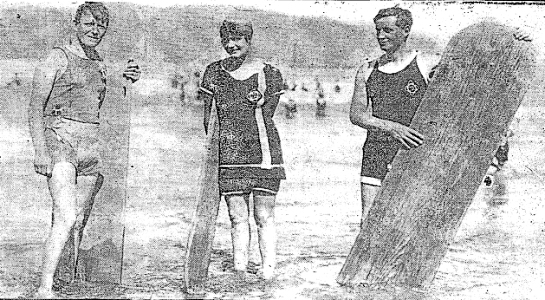 The presence of two surf boards, manned by members of the Life-saving Club, proved welcome to many a tired swimmer. The boards enabled swimmers to rest on their journey to tho shore, and saved the life-savers many a swim. The boards patrolled the channel all the morning, and on one occasion brought four swimmers ashore. Later two others were taken on board and carried into shallow water. How many swimmers were merely assisted is not known. The boards were a distinct success, and whenever there is a similar channel, on the beach in future they will be used by the life-savers. Sydney, Sunday 31 March 1918, page 3. The N.S.W. Surf Bathing Association is holding a Surf Carnival at Cronulla Beach, commencing at 11.30 a.m. to-morrow. All events are open to members of affiliated clubs under 20 years of age, and present and returned members of the A.I.F. only. A splendid entry has been received, and a programme consisting of 15 items will be competed. There will also be a display, of surf shooting and 'Duke' surf board riding. The whole of the proceeds are in aid of the Australian Red Cross. The curtain rises upon a cave in the Island of Puna, where the pleasure-loving islanders sing and strum at one of the many self-imposed holiday picnics which so exasperate their "sugar-man" - the American manager of a great sugar plantation. Suddenly the sun-filled scene, with the bright blue sea beyond the plumy palms drowsing by the shore, is overcast by a passing storm. A clever spectacular device suggests the torrents of rain which fall upon the beach without touching the groups beneath the trees inland, and then in a moment the tropical visitation melts like a dream, and the somnolent sunshine-charm reasserts its accustomed sway. In this way infinite artistic skill has been bestowed upon the mounting of "The Bird of Paradise" all through to the tragic close, where the gloomy volcanic mountain of Pelo vomits flame and steam. Here the unhappy princess-heroine leaps into the glowing crater BB the needed human sacrifice to appease the offended deity, and save her suffering people. Muriel Starr is linked with these scenes as Luana, the central figure of the romantic love story. Incidentally, Luana's career emphasises the misery ultimately and inevitably caused by the union of an educated white man with a half-civilised native, and further exposes the moral deterioration arising from life in one of these Pacific paradises, where everything comes for the asking, and the warm tropical sun, with flower-covered fingers, binds and paralyses the healthy action of heart and brain. New York, June 9, 1918, Section 3, page 28. 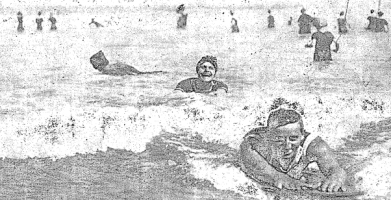 With the ocean temperature remaining above 70 degrees throughout the week bathing has become the leading amusement at Atlantic City, and the number of surf devotees is growing dally. will be assigned to duty for the season next Monday. Every man aspiring to duty in the patrol must show his ability with the lifeboat and can buoy and in swimming, and the tests are held under difficult conditions to insure the selection of the best athletes for the life saving contingents. Since this method was adopted there has not been a single drowning along the entire beach. In order to provide amusement for the bathers certain portions of the water have been set aside for surf board riders and visitors who like to shoot the breakers in canoes. the exclusive use of the canoers. Wailuku, June 14, 1918, page 5. 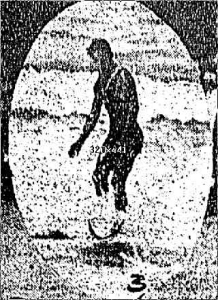 Miss Margaret MeCabe, of tho Outrigger Club swimming team, saved Private Robert Gunn, of the Fort Kamehameha sanitary corps from drowning at Waikiki yesterday morning. The girl was on her way lo the "big surf" with her surf board when :she heard Gunn calling for help. The man was nearly unconscious but the girl managed to get-her surf board beneath him and then tow him ashore where he arrived in entirely unconscious condition. Over exertion is supposed to have been the cause of the accident. New York, June 23, 1918, Section 3, page 25. Beach guards are having a hard time of it keeping bare limbed bathing girls off the beach in accordance with an order from the City Commissioners. Many of the Jersey coast resorts permit the omission of hosiery, but Atlantic City Is maintaining the policy of previous years and barring any display of stockingless limbs along the bathing beaches. Hooverized bathing attire, however, is permitted, and women are taking full advantage of the ruling which permits mannish suits to be worn. wrap will go into effect within this next fortnight. Surf board devotees have adopted a new stunt for coasting about the shallow water. Instead of riding the breakrs they now come in close to shore, and after the combers have flattened out take a running dive as If they were handling a sled and then shoot along on top of the water for long distances. Philadelphia, July 6, 1918, page 20. Atlantic City and the other seaside resorts. New York, July 7, 1918, Section 3, page 26. The Seabright Beach Club is to have a new form of surf diversion. Last season the rage was for surf riding with a surf board. This year there is to be another form of bathing pleasure that in all probability will eclipse surf riding. There is to be shipped to the club within the next few days a long inflated surf raft. This octagonal canvas raft will hold from three to five persons, and will not turn over no matter how many happen to get aboard. It will enable the bathers to enjoy unusual sport in riding over the high seas. It will also serve to assist swimmers who may encounter dlfflculties while swimming beyond the lines. This sort of pleasure craft has been used extensively at the Southern resorts all winter. The idea of the craft is credited to E. I. Horsman of Monmouth Beach. Honolulu, September 24, 1918, page 8. Regatta Day, as observed yesterday by the Outrigger Canoe Club sports and general public on the beach at Waikiki was an unqualified success. There was a good crowd on hand, everybody enjoying to the full program, which helped while away the whole morning, being over by noon. The canoe and surf board races were exciting enough to please all and there were some pretty and close finishes during the morning. The eourse, set for some of the canoe races was from Grey's to the Moana' Pier. The men's paddling canoe race was won by the Outrigger Canoe Club by four feet. The crews were: Outrigger H. Harvey, C. Lambert Jr., T. Norgaard, C. Hims, F. Bowers and Edric Cooke; Hui Nalu "Steamboat Bill," T. Holatein, T. Hill, William Hollinger, F. Wilhelm and Lukela Kaupiko. In the paddling surf board race for boys under sixteen years of age A Mineville Jr., won by a walk. L. Hale was second and J. Morse third. The distance was from the Seaside to the Moana Pier. Miss Helen Martin won the paddling surf board race for ladies, also by a walk. Miss Josephine Hopkins being second. This victory gives Miss Helen the title of club champion for the year. In the paddling Indian canoe race for men in the service C. Lambert Jr., and F. Bowers won easily over Koss and Canario, the latter's canoe capsizing during the race and the crew completing the course by swimming in fine shape. Mr. Chitterbrick was easily the winner in the paddling surf board race for malihini entries, defeating W. Dixon, the surf board expert, Chitterbrick looks easily like a coming champion, says "Dad" Center, who ought to know as he is reckoned Hawaii greatest authority on the subject. It was a pretty rare when three waihine opio crews got off in the paddling Indian canoe event for girls. Marion Dowsett and Frances Jones won eventually. Helen Martin and Bernice Dowsett weie second, while Josephine Hopkins and Daisy Kuttmann finished third. The latter crew capsized their canoe three times during the race. The eighth event, padding Indian canoe for boys under fourteen years of age was called off owing to the sea being a little tad choppy for the youngsters. 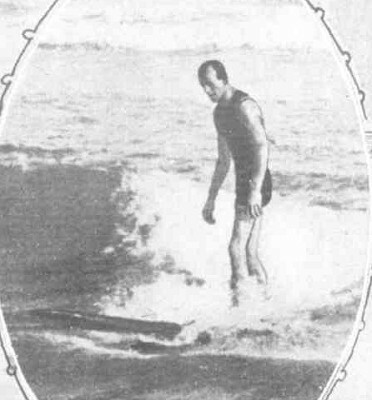 Edric Cooke finished first in the patddling surf board race for men. T. Norgaard was second, and C. Sims third. Others paddled, too, but were not in at the finish. Cooke gave the other two men a fifteen yard handicap and won even then. There was a lot of fun in the papdling canoe race for boys under sixteen. It resulted in a tie in the first heat between Canoe Aa and Canoe White Horse. Then the Wlhite, Horse got foul of t lit lite line and the judges ordered the race paddled over again when Canoe Aa capsized. Just how the race finally resulted no one seems to know yet. The crews were Canoe Aa- A. Mineville Jr., Tookie Cfinpiu. ('. Gall, J. O'Dowda, J. Mann and H Burband. Canoe White Horse- Lewis Hale. A Gall. .1. Hongs, G. Young and C. A Sayres. the Signal Corps team, IV I I, 1510 IS i.
victory tor Hi" Outrigger buuch in the tiniil set. The Outrigger plavers were, in the first set Johnson. Kuttmann, Morse W. Smith. Nottage and Smith; in the second " Dad " Center. Lindsay, Bailey, Dickson, Decker, and Harvey, and in the third -Britton, W. Smith, Morse Nottiige H. Mm it h and Johnson. The Signal Corps players were Canario, Bowers. Lambert, Shepherd, Ross and Grimier. being present, dancing to the music of Dude Miller's Hawaiian quintet. Sydney, Sunday 18 August 1918 page 13. When the Niagara leaves for America she will take an enterprising young Aus tralian sportswoman with her. This is Miss Isabel Letham, of Freshwater, who forsakes her own country for moving picture work in America. Miss Letham will break in on a new side. She is finely athletic, can play most games, and rides well. But it will be for her work in the water that she will appeal to the Americans. She is an expert surf shooter, and a fine performer on the surf-board, with which she has interopted so many visitors to Freshwater in the season. She manipulates the big board in true Hawaiian style, and among her feats is the bringing in of a pouple of passengers upon it from the outside breakers. ''She is afraid of nothing,'' said a friend of Miss Letham's the other day. ''Yes, I am, I am afraid of sharks,'' she contradicted. Yet this does not prevent her from tearing round the harbor on an aqua plane which is being towed behind a motor boat at 15 miles an hour. In her picture shown on this page Miss Letham on a board which is about 3ft long by 18in. wide. Below her is the sharkin fested harbor, and it is only her nerve and her wonderful balance that keep her out of it. Miss Letham fell once or twice while learning the art of aquaplaning, her most disturbing experience being when she slipped off as she was passing Sydney Heads. 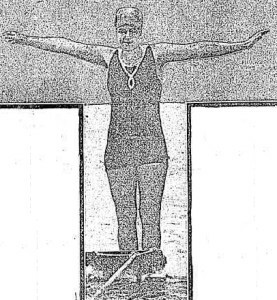 Aquaplaning has not caught on with the girl swimmers of Sydney to any great extent. It is too dangerous, and the sharks are so great a menace. Miss Letham, however, pronounpes it the finest sport in the world, notwithstanding the fascination the sun has tor her. The Freshwater mermaid is eagerly anticipating the joys of Honolulu. No, she does not hunger for the sights and scenes of Hawaiian beauty. Grafton, NSW : 1915 - 1954), 5 December 1918, page 4. Miss Mildred Leo Clemens, a niece of the famous American humorist, gave amost interesting/discourse on MarkTwain as she knew him. The projection of the pictures was all that could be desired. Some cinematograph pictures were also shown, including surf board riding on the famous Waikiki beach, outrigger canoes, fish in an aquarium and a volcano in eruption, both by day and by night. These last-named pictures possessed a special educational value. Altogether, the ramble through Paradise was a pictorial feast and Miss Clemens well deserved the long-continued applause which followed its conclusion. Lismore, December 1918, page 4. Miss Mildred Les Clemens, whom Mrs. Dye had said earlier was regarded as the youngest lady lecturess lecturing on the platform in America, gave a delightful lecture. Covering ground taken by her famous cousin, Mark Twain (S. Clemens), in his works, Miss Clemens described the beauties of the Hawaiian Islands, and also introduced tho audience to the well-known splendor of the Nevada Mountains and the grandeur of the hinterland, but only recentlv made accessible to tourists. All the pictures constituting the film, a really magnificent and unique collection, were taken by Miss Clemens herself. It was in 1895, said Miss Clemens that Mark Twain on„ the"v^tura . -journey from Australia visited ■ '-1;He_^;Sawaiiaii' •. Islands, which she had the jdeasure of doing ,. ;vea-y many years later. Under 'the control of U.S.A., the Hawaiia'rihlslahds were":: destined to become aji important gate as regarded the! -voi-ld of commence. The screening of "an c.-cquisite view of the setting sun trans forming the ultramarine of ■ the ocean as the equator. is approached1 into a sheet of- gold .was a. fitting: introduction vto (lie excursion intc- the "Paradise of tho Pacific. ':' Groups, of llawaiians, clothed in their garments of bright and 'vavietl hue, were next depicted. The noted iloral places were shown, and an illustration of a street corner blaziag forth in the colors .of- gorgeous flowers brought forth, rapturous applause. • Honolulu was a city of- about 70,000 inhabitants. Proceed-1 'ing, there was shown-. ;an extinct volcano _in the n jighborhaad, and. now covered, ex quisitely with grasses and . looking: like a crouching lion in the distance.. One! of' the features - ofthe islands, said -the lecturess, was .the most beautiful, .palm trees,-which Mark Twain had described as featheir dusters struck by. -lightning. Views .of-a beautiful quay next crossed the screen. Th«s Hawaiian is noted for his abilitySas a shim mer. As sMark Twain said, "Swimming is to the Havyhiiaai of; first importance, walk: ing. of secondary importance.'' And what the humorist tilted at was admirably de picited by views of those .marvellously dex terous swimmers enjoying the exciting ex perience of surf-board riding. Excellent views 6f fish in their haunts were shown. The aquarium, it was said,, rivalled Naples, and the fish were "indescribable for their beauty, variety and edor. Melbourne, Saturday 28 December 1918, page 27. 2. PLAYING IN THE SAND. Geoff Cater (1997-2016) : Newspapers, 1918.